Oddly enough, the Federal government is actually popular in this dystopian future. It is just ridiculously ineffectual. Combat 21 and his storm-trooper cult basically terrorize the futuristic capitol city with impunity. 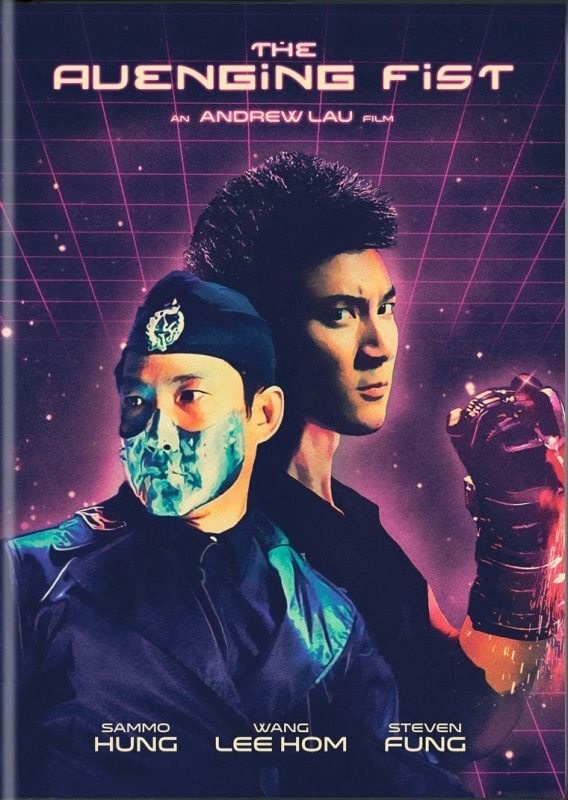 Only a group of genetically-enhanced twenty-something looking teenagers can stop them in Andrew Lau & Corey Yuen’s wildly over the top The Avenging Fist (trailer here), which releases today on DVD from Well Go USA. Sadly, Mega Nova and Belle never knew their father Thunder, an elite policeman killed in the line of duty—except not really. Thunder and their mother Wing were part of the Power Glove pilot program, one of the unpleasant secrets of the former government. Nova and Belle were tests cases in the next phase of the government’s efforts to harness the supposed unused 80% of the human brain (which implies mankind is devolving). Rather than consign them to a guinea pig’s life, Wing spirited them away. Now they live an underground existence, if by underground you mean constant clubbing and jet-scouter drag racing. However, when Combat 21 gets wind of their X-Men like abilities, he unleashes his brainwashed army in their National Socialist uniforms, which tragically enough includes Thunder. At least they might have an ally in Inspector Dark, Thunder’s former colleague—the one who supposedly killed him, but he clearly didn’t do it decisively enough. Everything about this film is totally nuts, in both good and bad ways. It started out as a rip-off of the Tekken video game franchise so blatant it led to billable hours, but apparently screenwriter Sap Sam (Thirteen) Chan resorted to time-tested strategy of convoluting the plot into such a nonsensical rat’s nest, nobody would want to claim it resembled their I.P. Seriously, this is a film in which a glove is used to access unused portions of the brain. If you are waiting for logic to show up, you will see the closing credits first. On the other hand, The Avenging Fist also features Master Sammo Hung sporting a shiny silver fedora and Gigi Leung rocking an Afro-cut. Indeed, there is something reassuring about his presence and Cecilia Yip adds some class as “Aunt” Wing. Frustratingly, the cosmic fireballs and psychic force fields water down Yuen’s action choreography, but Biao Yuen still has his moments as Thunder. As for the special effects, they might have been considered state of the art in 2001, but they have not aged well. Gee, the cast is cute though, especially Leung as Erika, the supermodel. Frankly, it is hard to fathom how Avenging Fist managed to miss becoming a midnight tradition at the Alamo Drafthouse. It is absolutely impossible to explain the film’s bizarre chain of events or how any of its internal systems supposedly work, but it is kind of fun to stare at it in utter disbelief. Recommended for fans of cult film lunacy, The Avenging Fist is now available on DVD from Well Go USA.